1 A None No Power Seat 1 A is a standard Business Class Bulkhead seat. There may be no floor storage for this seat during take-off and landing. 1 C None No Power Seat 1 C is a standard Business Class Bulkhead seat. There may be no floor storage for this seat during take-off and landing. 1 D None No Power Seat 1 D is a Business Class seat. The proximity to the galley may be bothersome. There may be no floor storage for this seat during take-off and landing. 1 F None No Power Seat 1 F is a Business Class seat. The proximity to the galley may be bothersome. There may be no floor storage for this seat during take-off and landing. 12 A None No Power Seat 12 A is an Economy Class seat that may have limited recline due to the Exit Row behind. 12 B None No Power Seat 12 B is an Economy Class seat that may have limited recline due to the Exit Row behind. 12 C None No Power Seat 12 C is an Economy Class seat that may have limited recline due to the Exit Row behind. 12 D None No Power Seat 12 D is an Economy Class seat that may have limited recline due to the Exit Row behind. 12 E None No Power Seat 12 E is an Economy Class seat that may have limited recline due to the Exit Row behind. 12 F None No Power Seat 12 F is an Economy Class seat that may have limited recline due to the Exit Row behind. 13 A None No Power Seat 13 A is an Economy X Class Exit Row seat that has additional legroom. There is no floor storage for this seat during take-off and landing. 13 B None No Power Seat 13 B is an Economy X Class Exit Row seat that has additional legroom. There is no floor storage for this seat during take-off and landing. 13 C None No Power Seat 13 C is an Economy X Class Exit Row seat that has additional legroom. There is no floor storage for this seat during take-off and landing. 13 D None No Power Seat 13 D is an Economy X Class Exit Row seat that has additional legroom. There is no floor storage for this seat during take-off and landing. 13 E None No Power Seat 13 E is an Economy X Class Exit Row seat that has additional legroom. There is no floor storage for this seat during take-off and landing. 13 F None No Power Seat 13 F is an Economy X Class Exit Row seat that has additional legroom. There is no floor storage for this seat during take-off and landing. 14 A None No Power Seat 14 A is an Economy X Class Exit Row seat that has additional legroom. There is no floor storage for this seat during take-off and landing. 14 B None No Power Seat 14 B is an Economy X Class Exit Row seat that has additional legroom. There is no floor storage for this seat during take-off and landing. 14 C None No Power Seat 14 C is an Economy X Class Exit Row seat that has additional legroom. There is no floor storage for this seat during take-off and landing. 14 D None No Power Seat 14 D is an Economy X Class Exit Row seat that has additional legroom. There is no floor storage for this seat during take-off and landing. 14 E None No Power Seat 14 E is an Economy X Class Exit Row seat that has additional legroom. There is no floor storage for this seat during take-off and landing. 14 F None No Power Seat 14 F is an Economy X Class Exit Row seat that has additional legroom. There is no floor storage for this seat during take-off and landing. 3 A None No Power Seat 3 A is an Economy X Class Bulkhead seat with additional legroom. The tray table is in the armrest, making the armrest immovable and slightly reducing seat width. There may be no floor storage during take-off and landing. 3 B None No Power Seat 3 B is an Economy X Class Bulkhead seat with additional legroom. The tray table is in the armrest, making the armrest immovable and slightly reducing seat width. There may be no floor storage during take-off and landing. 3 C None No Power Seat 3 C is an Economy X Class Bulkhead seat with additional legroom. The tray table is in the armrest, making the armrest immovable and slightly reducing seat width. There may be no floor storage during take-off and landing. 3 D None No Power Seat 3 D is an Economy X Class Bulkhead seat with additional legroom. The tray table is in the armrest, making the armrest immovable and slightly reducing seat width. There may be no floor storage during take-off and landing. 3 E None No Power Seat 3 E is an Economy X Class Bulkhead seat with additional legroom. The tray table is in the armrest, making the armrest immovable and slightly reducing seat width. There may be no floor storage during take-off and landing. 3 F None No Power Seat 3 F is an Economy X Class Bulkhead seat with additional legroom. The tray table is in the armrest, making the armrest immovable and slightly reducing seat width. There may be no floor storage during take-off and landing. 30 A None No Power Seat 30 A is an Economy Class seat in the last row of the plane that may have limited recline. The close proximity to the lavatory may be bothersome. 30 B None No Power Seat 30 B is an Economy Class seat in the last row of the plane that may have limited recline. The close proximity to the lavatory may be bothersome. 30 C None No Power Seat 30 C is an Economy Class seat in the last row of the plane that may have limited recline. The close proximity to the lavatory may be bothersome. 30 D None No Power Seat 30 D is an Economy Class seat in the last row of the plane that may have limited recline. The close proximity to the lavatory may be bothersome. 30 E None No Power Seat 30 E is an Economy Class seat in the last row of the plane that may have limited recline. The close proximity to the lavatory may be bothersome. 30 F None No Power Seat 30 F is an Economy Class seat in the last row of the plane that may have limited recline. The close proximity to the lavatory may be bothersome. 4 A None No Power Seat 4 A is a standard Economy X Class seat. 4 B None No Power Seat 4 B is a standard Economy X Class seat. 4 C None No Power Seat 4 C is a standard Economy X Class seat. 4 D None No Power Seat 4 D is a standard Economy X Class seat. 4 E None No Power Seat 4 E is a standard Economy X Class seat. 4 F None No Power Seat 4 F is a standard Economy X Class seat. 5 A None No Power Seat 5 A is a standard Economy X Class seat. 5 B None No Power Seat 5 B is a standard Economy X Class seat. 5 C None No Power Seat 5 C is a standard Economy X Class seat. 5 D None No Power Seat 5 D is a standard Economy X Class seat. 5 E None No Power Seat 5 E is a standard Economy X Class seat. 5 F None No Power Seat 5 F is a standard Economy X Class seat. 9 A None No Power Seat 9 A is an Economy Class seat that is missing a window. Virgin Australia offers wireless In-Flight Entertainment across its domestic and international short haul fleet. This system provides access to hundreds of hours movies, TV shows, and music- all available on your own Wi-Fi enabled device. The Business class menu offers a gourmet food, with various options for breakfast, lunch and dinner ranging from snacks to meals. On flights longer than 3 hours, the Business class provides a three-course meal for lunch and dinner. The Economy class also offers an array of gourmet snack and meal options, with complimentary beer and wine on flights departing between 4 p.m. and 7 p.m., Monday through Friday. 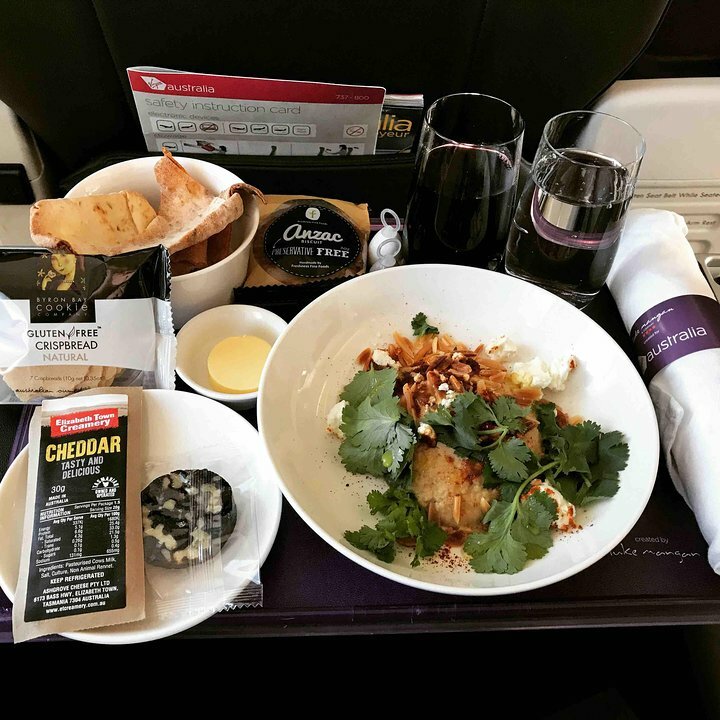 Virgin Australia's Boeing 737-800 with Business Class is used for domestic flights within Australia. The aircraft seats a total of 176 passengers. 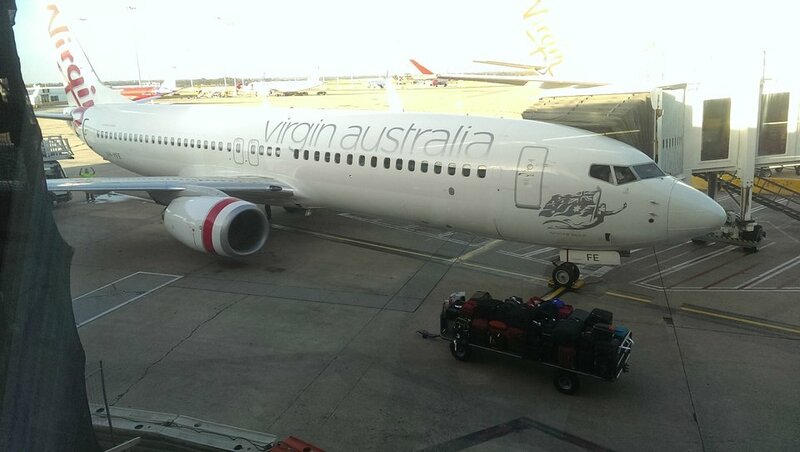 Virgin Australia flies the Economy X experience on this aircraft. Economy X offers a more premium experience at the airport and onboard. Economy X seats have additional legroom, preferred overhead storage space, priority boarding as well as priority screening at the airport. Not only does this seat protrude into the aisle due to the curvature of the fuselage, but it (and seat 29C/D) is actually narrower than the other normal economy seats - compare the back of the seat to the one next to it. AVOID AT ALL COSTS! Minimum legroom / pitch is 34 inches in rows 4 &5. There is very little room as the seats are narrow and I am only 72KGs.Heaven help anyone who is large. Only 2 toilets for all economy passengers meant there was constant queues and not particularly clean. Food was ordinary. Not a particularly pleasant or comfortable flight.May have to try the competition next time. In front of exit row. Flight attendants dont unlock recline after take off for this row. Row 14 is where it is at. All the rookies complaining about row 13 not reclining - der fred! It is an emergency exit row!! Small sacrifice to not wear over ear earphones on take off and landing.. big woop. Oh, and to the whiners from row 13 - guess what - row 14 reclines! Heaps of leg room, rarely anyone next to you as it is a premium product (you pay more for it). I book this seat erry time I fly (which is twice weekly). Not a bad perch. Worst two flights I have ever been on. VA465 was from Perth to Brisbane, VA466 the reverse.The seats are too narrow and legroom insufficient. I am 178cm tall and weigh approx 100kg, so not a huge person. This aircraft, in my opinion, is totally unsuitable for flights longer than 2hrs duration. Virgin have lost me as a customer. In future I will be looking to other airlines. Their disregard for the comfort of their passengers is a disgrace. Disappointing to have the surprise of no window when travelling with a child who is looking forward to seeing out the window. Aircraft is generally tired and old. My seat was fine, no problems. The only issue is there are only two toilets for 168 economy passengers - this results in a queue of 5- 15 passengers down the aisle during the flight waiting to go. I was seated in exit row seat 13F which is window seat.This is a very bad seat. Being an exit seat it does have extra leg room however their is a trade off. Seat does not recline being exit row, bags must go in overhead, window seat has no arm rest and you are not allowed to use earphones on landings and take offs.In addition because bags must go in overhead there is a lot more buggering around by exit row passengers accessing overheads which can make it difficult to sleep. Overall, the Virgin Australia Boeing 737 aircraft was a smooth, new aircraft that offered a range of great in-flight services. Including, streamed in-flight screening on any device, great customer service by the crew all the way from takeoff to landing both in the airports and in the air. I would highly recommend flying with VA. I was unfortunate enough to have to sit here as we have a family of four and the 3+3 configuration doesn't work for us. The seats are not fit for anyone taller than 175cm and/or wider than a 36" waist. I'm relatively small myself (165cm ) and the seat just fits with about 10-15cm legroom. As so often happens, the guy next to me was way too big for the seat and spilled over to my seat. He obviously tried his best not to but it's physics. For 5+ hours I had to sit there with the arm rest up (he couldn't fit) and kids crying through the whole flight around us. The seats are so thin that as soon as the guy behind me put a bottle in the pockets i felt it in my back side. Sorry Virgin, but you need to do something about the seating in these old planes instead of trying to fit in as many seats as you can. Also note that there's no entertainment system in the seats and you need to use your own device. I was moved to this seat before I boarded, and I glad I was. The seat had amazing legroom, and although you had 1 1/2 windows, you need to lean back or forward to actually see the window. Also, watch out for dripping water. 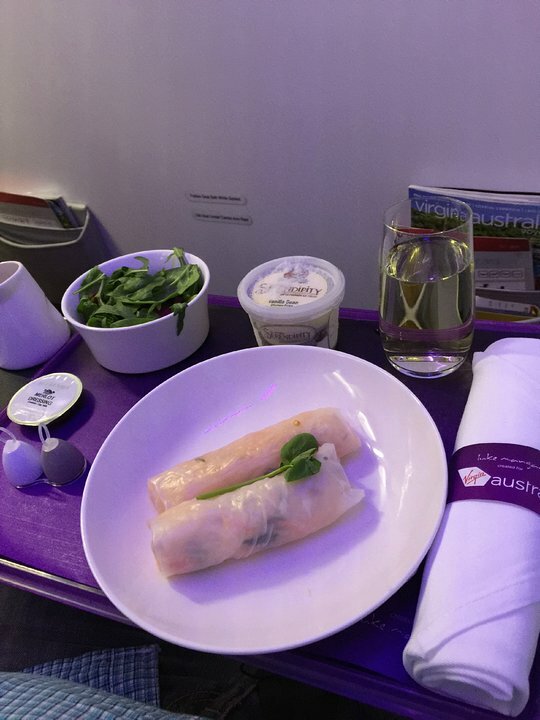 Virgin Australia never disappoint on their service. The seats are comfortable and spacious. There is no dedicated TV, you need to bring your own tablet or you can ask the cabin crew to provide you with a virgin tablet to access the IFE. The meals were fantastic. Allocated a 'middle' seat and asked if I could be allocated a window seat. After some tapping at a keyboard Virgin Adelaide staff said there was one window seat left. "Great," I said, "is it on the port side or the starboard side?" "What does that mean?" asked the lady from Virgin. Explained that port meant left and starboard meant right and was told it was a window seat on the left side ... Seat 9A. "It's nearer the front," she added cheerfully. 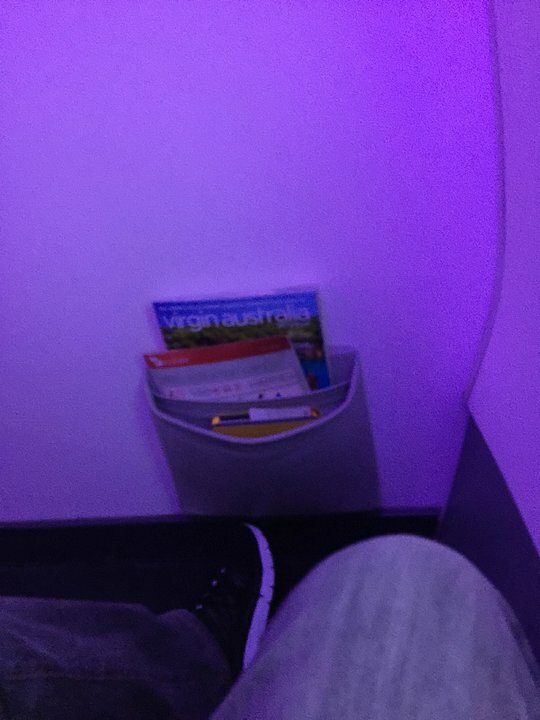 Cramped up against a windowless wall on the flight from Adelaide to Brisbane on 25 May 17, it was my worst ever experience with Virgin Australia. This is a BAD seat. It does not recline. I paid extra for this seat because of the extra legroom, but I didn't know that it doesn't recline. I feel cheated for paying the extra money. Originally booked 9c on a smaller aircraft. then the plane was changed and the ground staff said.. Well at least you got to keep your seat! I actually could not sit in 9c. Not only is it the only spot on the plane with NO window, the seat is right up against the wall. Very cramped if someone is next to you. I had to move. the Claustrophobia in that seat was shocking. when I asked why there was window, no one knew. You could not even see out the windows of the row in front or behind. the whole row should be avoided. Disappointed to have selected a window seat when I was booking the flight, only to find NO WINDOW beside seat 9A when I got onto the plane. Was forced to look at a solid wall for the duration of the flight. The corresponding seat across the aisle had a window . Checked myself into this seat for MEL -> BNE flight. Should have consulted SeatGuru first. Horrible seat, would have to be worst on the plane. No window so you are completely wedged between people to the right and that rough white plastic to the left. And, as a standard seat, there is no leg room to offset lack of window. Avoid 9A, it's just awful! Window seat with good outside views, and no corridor traffic hassles. Couldn't stretch my legs out fully due to wall and wished there was a foot rest for leg comfort(though short haul was fine). Seat was supportive for sleeping. Any galley noise was not noticeable. 2A or 2F provide the best seats in business class on this plane. They offer the same amount of legroom as row 1 however they offer additional privacy as due to the design of the divider between business and economy, there is very little angle by which an economy passenger can peer into what you are working on your laptop, reading, etc. The 737 fleet operated by Virgin Australia have the worst seats of any plane or airline in the region. Anything else is better. How they can justify using them for flights to NZ and Pacific Islands is beyond me. The Virgin business class seat ( 1C ) great legroom, wide seat and reasonable recline. Very attentive service. The passenger in the row next to me said to avoid his seat ( 1F and the one next to it ) as you get noise from the gallery. I heard nothing!! Flew Hamilton Island to Melbourne. Plenty of leg room, and very comftable seat for a three hour flight. Crew were very attentive. Proximity to the lavatory wasn't a issue, it was only used by those in business class. Loads of leg room. Row 13 can not recline into your row as its a exit row. Row 14 can recline however the row infront can not recline into your space. So ideal seat. Flight crew do not allow you to use over ear headphones during take off and landing in exit row seats. You can use in ear style headphones only. Great plane, my flight was from Bali to Sydney. My flight left at 12.10PM [Bali Time] and arrived in Sydney at 9.00 [Sydney Time]. The only down side of this flight was that you got served dinner at about 1.30 AM and then when you woke up you didn't get any breakfast. However the food was excellent. Flew from Rarotonga to Auckland. The seats are small and hard as a board. I do believe the most uncomfortable I have ever been on an aircraft. Flew Sydney-Brisbane-Sydney October 24 2015 in seats 14C & 14D. 38" pitch, same as business class. Fantastic seats if you can get them. Same with 13 A-F.
Good for short haul flights, Had a very nice business class meal and comfortable flight for the short haul. Terrible leg room, and you have to climb over other passengers to get out. No views from this seat because of wing. Even back to row 20 panoromic view is restricted. I dont consider seats over wing or just behind wing good seats for seeing Sydney on arrival from Fiji. They may be safer if have to ditch or in rough weather- best seats for nervous flyers. Great seats with fine weather at origin and destination, VA use front and rear door boarding and disembarkation, can quite easily be off the plane before the business class passengers who have to wait for the aerobridge to be docked. We had this flight from Melbourne to Perth. Just over 4 hours of being squashed like sardines in a tin. My husband is not tall but his knees were locked against the seat in front. No in flight entertainment. A child screaming the entire flight. 2 toilets at the front for business class (of which there were very few) and two toilets for the other 168 passengers to share for the 4 hours of total boredem. No room to move, freezing with no blankets available when asked for as we were both ill. Basically, compared to Jetstar, we paid an additional $110 for a suitcase and a meal. Virgin have lost my vote. 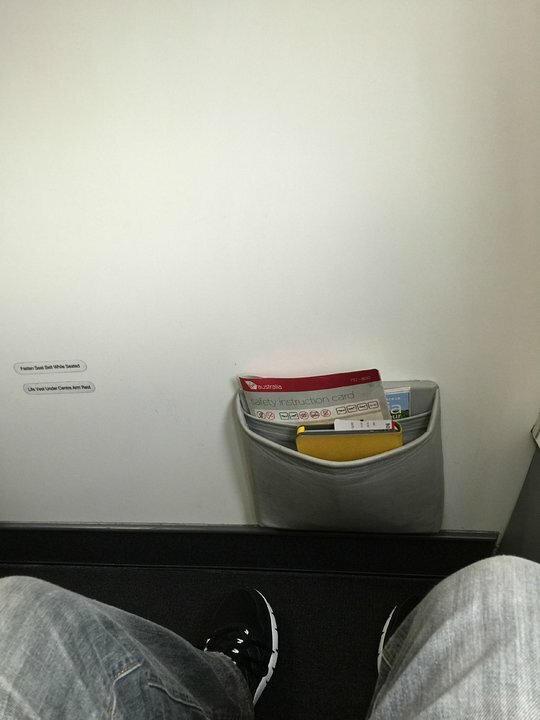 Im 6' 4" and found i could not sit comfortably due to lack of leg space. I spent most of the flight standing. I complained only to be told i should have paid more for an emergency exit seat, however i travel as caregiver for my wife who is unfit to be in an emergency exit!. I have no choice but to instruct the people that book our medical flights not to use Virgin Australia again. Seat was satisfactory. The only problem with the flight was that by the time they reached us with the food trolley they had run out of both types of pies and all sandwiches and only had inedible vegetarian falafels (as proven by my wife who is vegetarian) for the last 10 rows of the full flight. This isn't a bad seat it's terrible. Staff spend the flight opening cupboards and always BANG them shut both before snacks and after, then chat endlessly and the toilet door bangs the seat almost every time it is opened. There is no overhead luggage space due to disposable cup storage. The worst flight I've ever had. There is no floor storage in this row. There is also limited overhead locker storage. Have flown on this aircraft type about 50 times in 2014. Virgin Australia flies 1 versions of Boeing 737-800 Business.